Are you a student or professional who would benefit from tracking your research time in your research log? A new time-tracker feature has been developed for ResearchTies and is now in the testing phase. If you would like to participate in the beta test, please send an email to: support@researchties.com to request access to this new feature. Using the time tracker is simple: click the timer icon, state the current research activity, then start the timer. You will see the timer running on the toolbar. When the activity is complete, click the timer again to record the ending time. All entries are editable and a PDF or Excel® report can be created for a client or professor. Try it today! 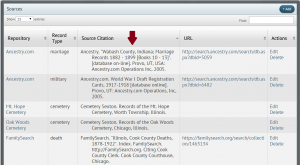 We are excited to announce that the search capacity of ResearchTies has been improved recently. When objectives and searches have been data entered for a “family,” it has always been possible to search and retrieve it by family. With the new changes, the search engine will now locate all entries for a family, as well as every entry for each individual who is a member of that family. 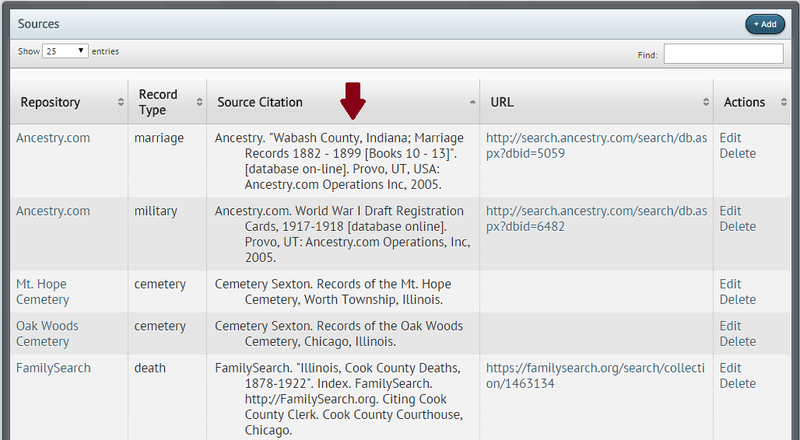 If objectives and searches were entered for individuals, they can now be retrieved when a search is conducted for all data relevant to their family. These entries are connected by the marriage record number of the parent couple. When a family is recorded, the marriage number is entered on the family template. This connects the husband and wife to the marriage number. 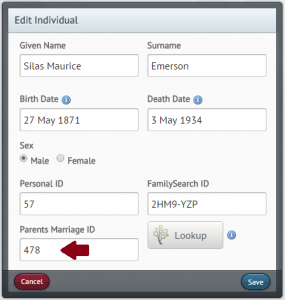 When the children are added to the individual list, the template asks for the marriage record number of their parents. This process connects each child to the parents’ marriage number. 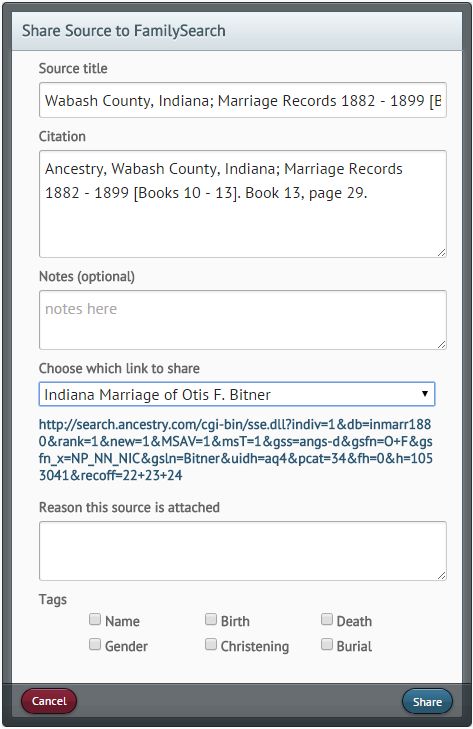 Be sure to include these numbers from your genealogical data management program, and ResearchTies will be able to retrieve all entries for the husband, wife, and all children in a family. 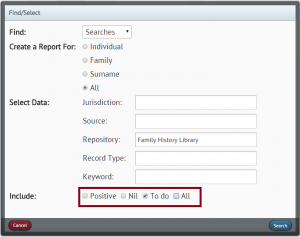 To generate a report for all work done for a family, conduct a search for all objectives for that family. Click “select all” in the upper left corner (or select specific objectives to include in the report using the check boxes to the left). 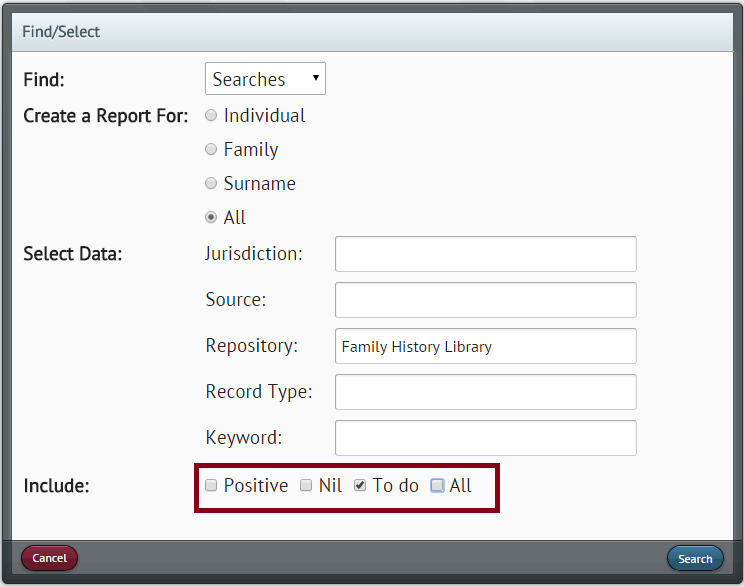 Then, click “report.” Select “Objectives, related searches and results,” and click “Next.” Choose PDF or Excel format, and the report will be generated. In order to use this functionality, go to your family list and check to see that all Marriage ID numbers are recorded. Then, go to the Individual List to be sure that each person has their parents’ marriage ID recorded. With the numbers in place, ResearchTies has the ability to retrieve all data for a family in a matter of seconds.